To be frank, I have the feeling that in Kazan we were expecting the crisis. It's not that we're economic specialists, but no one was at all surprised. Kazan is the capital of Tartarstan, which is one of the most industrially developed Russian regions. We have KamAZ, the chemical industry, and we make Tupolev planes and Mil helicopters. But, most importantly, we have oil. The good life, you might think. Even now there are hundreds of vacancies in many companies. But people don't want to work in factories. My friend is in charge of external public services and amenities at a large commercial centre. When the crisis started she had queues of people wanting to become caretakers or yard-keepers. They don't want to be lathe operators. I had a chat with my father over breakfast and realised why. My father is an exceptionally talented toolmaker. People bring him a spare part and he constructs a machine to make it. He often works on bank holidays and weekends and stays overtime on weekdays. He earns 8-10,000 roubles a month for this work. But he isn't always paid. It's exactly the same at other factories. Low wages and machinery that was out of date a long time ago completely kill any desire to go and work there. Where the money is more or less decent there are no problems with staff as a rule. But this only goes for oil and petrochemicals. The oil price has collapsed and nothing else was working brilliantly anyway. No surprises there, then. ‘Redundancies' started in factories and companies at the beginning of the year. I put the word in quotes because they're not actually redundancies at all. By law an employee who is made redundant because staff numbers are being reduced is entitled to a sizeable amount of compensation. In order to avoid paying out these sums, employers compel their employees to resign of their own volition. If they refuse, they are sacked on legal grounds e.g. for ‘systematic disciplinary infringements'. You can't disprove this in our courts - no one will even try. All they have to do is antedate a couple of instructions to reprimand an employee and that's already grounds for dismissal. So no one even thinks of resisting: they write out their resignation and find themselves in the street without any severance pay. Anyone who has been dismissed ‘for disciplinary reasons' has no chance of finding another job. No one will try and sort out what actually happened and if the potential employer does work it out, he'll wonder why he needs such a stroppy employee. Some employers take an even easier route. When they issue the document confirming employment, they ask for an undated resignation letter. I found this out from the accountant at one of the factories in Kazan. The director is trying to force her to resign, but she's resisting. Her position is such that the director himself will have to abide by all the rules when sacking her, as she's a single mother with a child under 3. The child allowance is not enough to live on and the child has to be fed, so the mother went back to work early. Then the crisis happened. She says she will fight until the last and she's even been to the office of the Prosecutor General of Tatarstan, where she was supported in her resolve. She has been fighting for several months, but one can only imagine what strength this requires and the conditions she must have to work in. 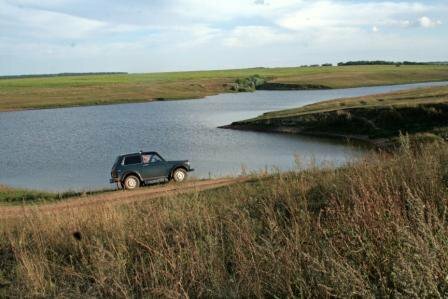 Every family in Kazan has a plot of land in the countryside. In times of crisis homegrown vegetables and fruit are an important resource. More frequently people have to accept a pay cut. Sometimes by half or a third. This is why all hopes are concentrated on the allotment. Almost every family in Kazan has a plot of land, even if only quite a small one. Recently people have been using it for pleasure - planting flowers and a lawn for picnics. Now they are ploughing it up and planting potatoes and onions. That way they'll have something to eat when winter comes. My neighbour along the corridor is Auntie Flora. She is a pensioner and her chief occupation is looking out for places to buy food more cheaply. Life in Kazan is quite expensive - sometimes more so than in Moscow, which is famed for its high prices. But you can find good prices if you look. Our current president Mintimer Shaimiev (who has been in the post since 1989) is an irrigation engineer by training. He understands about agriculture and as early as the 90s he made efforts to ensure that the system of collective and state farms would be preserved. At the very least this means that much of the food on sale in Tatarstan is locally produced. The rising price of the dollar has meant that imports have become much more expensive, but local produce is still affordable. The greed of the shopkeeper has a part to play, though - the mark-up in some shops is eyewatering, whereas others are more modest. Auntie Flora spends all day going from shop to bazaar and back, trying to find the lowest price. But what pleasure it gives her, when she manages to snap up something cheaply. Something to boast about to the neighbours! I don't blame her. On the contrary, I understand her very well. She has a small pension (only retired military personnel and civil servants have reasonably big pensions) and two-thirds of that goes on utility payments, so she has to be careful. I live in a new Kazan housing development called ‘Azino' and we have meters for water and electricity. But utility companies insist on averaging out bills. Every month my parents have to go to the building management office and demand that their bill be recalculated according to usage. For water alone that saves them 500 roubles a month. Communal flats, housing maintenance and utilities are the subjects most discussed at home and at work. Reforms have been ongoing for nearly 20 years, but communal services just get worse. And more expensive. At the end of the 90s we were told that we would now be paying 100% (there were colossal subsidies in Soviet times), but each year the tariffs are raised by 20-30%. The explanation for this used to be that energy prices were high. They are less now, but prices have still gone up by 20%. Hardly surprising that people wonder what it's all about. Every month we get a bill showing what payments have been deducted - how much and what for. I noticed that there was an item called ‘cleaning communal areas', for which we pay 150 roubles ($4.70). There are 360 flats in our block: if each flat pays on average even only 100 roubles (it depends on the number of residents), that means a minimum of 36,000 roubles ($1,132.650) a month. Our yard-keeper is paid no more than 8,000 ($251.70) a month, so what happens to the other 28,000 roubles ($880.95)? After all, we pay separately for rubbish collection and cleaning our entrance hall. We've been living in this flat for 9 years and no one has ever managed to give me a sensible answer to this question. Most of my friends in Kazan are educated. They love their city. Historians tell us that Kazan is more than 1000 years old. It came into being at the end of the 10th - early 11th century as a western outpost of Volga Bulgaria. In the 15th century it became the capital of the independent khanate of Kazan, until Ivan the Terrible conquered it in 1552 and annexed it to the Russian state. Since then Russian monarchs have been ‘Tsar of Muscovy and Kazan...'. Kazan has a lot of ancient architecture and is really a very beautiful and special city. The crescent moons of the minarets sit very comfortably next to the crosses on the churches and the mullahs' calls echo to the church bells ringing. Property owners in the Kazan's old town wait for their houses to fall down and the price of land to go up. My friends are very distressed that all this magnificence is slowly disintegrating. The houses where the great Russian singer Fyodor Chaliapin was born and where the poet Velimir Khlebnikov lived have disappeared. Even houses connected with the classics of Tatar literature and art are no more. A few steps away from the main streets and you are in a city which looks as though it has suffered the most barbaric bombing. When I was young I used to love wandering through these narrow streets with their comfortable old houses, looking at the delicate carving on the wooden architraves half covered by lilac bushes, and enjoying the honeyed aroma of the blossoming lime trees. They have now been replaced by Hi-Tech and refurbished buildings, which are absolutely tasteless and faceless. Or just wasteland, because the owners are waiting for the price of land to go up. It's all very sad. In the multicultural republic of Tatarstan viewers enjoy dances based on the oriental tradition. I remember where I used to live in the old city. It was in Tukayevsky street, formerly Yekaterininsky (Catherine Street), in the old Tatar quarter. There was a big courtyard not unlike the ‘well' courtyards of St Petersburg or those in the Arbat area of Moscow. Russians and Tatars lived there, alongside other nationalities and I can still remember all the feast days we celebrated. At Eid or Kurban Bayram the Tatars treated us to meat and pasties and at Easter we would go and visit them with painted eggs and kulich or Easter cake. I am glad to say that this still happens. Recently at Kurban Bayram we had multilayered Bulgarian pies or gubadiya, for the Passover we were all crunching matzos and for the Orthodox Easter there were painted eggs on all the desks. No one in Tatarstan takes any notice of your nationality or religion, the main thing is that you should be a good person. This is extremely precious to us all. Anyone who makes a politically incorrect remark about one or other nation or religion is regarded with great caution. Long may this continue! Our tolerance in Tatarstan makes it all the more scary for us to observe the growing xenophobia in Russia. There's a lot I don't understand. I can't imagine Russia without her Georgians - Okudzhava, Kikabidze, Basilashvili. I am not interested in the nationalities (past and present) of comedian Arkady Raikin, actor Andrei Mironov, comedian Roman Kartsev or the country's conscience - in Soviet times and now - Mikhail Zhvanetsky. How can I do without the Ukrainian writers Gogol and Shevchenko, the Belarusian writer Vasil Bykov or the Lithuanian actor Banionis? The art of these poets, singers, actors of stage and screen moves me and is very dear to me. And so it will remain. Sometimes I wonder why our government is so maniacally insistent that they fear an external threat. They appear to believe this most sincerely. I have a hypothesis. Given the current supine population in Russia, it's the West that is the real threat for our government. The thing is that for them their future, personal wellbeing and that of their family are not linked with Russia. For them Russia is only a means to an end, a place from which they siphon off money. Hence their stubborn refusal to develop the real economy. Why should they? All they have to do is sell our raw materials, oil and gas and buy up foreign companies abroad. Then you can understand their logic. They do the barest minimum inside the country, enough to enable them to hang on to power, damp down any discontent and have sole exploitation of the subsurface for as long as possible. Minimal social services, minimal expenditure on medicine and education. No interest at all in developing small and medium businesses, as they are dangerous for those currently in power: they might get stronger in time and be transformed into a real middle class which could demand a government with a more responsible attitude. In a word, they need to hang in there as long as possible. So the real threat for them does genuinely come from Western democracies, which are making serious attempts to address money laundering, where corporate raid is a crime and where at any moment you might hear the question ‘Guys, just how clean is your money?' Then it's curtains for you. You can understand the benevolent attitude to a bureaucracy too. Over the past 9 years it has enjoyed unheard of freedoms and grown to a colossal size. Civil servants are needed to implement all the measures essential to the government (presidential and State Duma elections which give the ‘correct' results, for instance), as well as to identify and eliminate any malcontents. It's known as the advantages of administrative office. In return for loyalty they are given a completely free hand. That's where the horrendous theft and corruption comes from. This government has no need of its own civil society and they have no control over the developed civil societies in other countries. It's this that makes the West such a bogeyman...probably a naïve way of looking at things, but it's what many people think. And I think I'm right. Even now, when the crisis has reached the most far-flung corners, nothing is being done to develop small businesses so as to provide a tax base for the government and jobs and salaries for the people. Quite recently one of my friends decided to open a café in one of the areas of Kazan. He even had the necessary equipment already. But several months have passed and he still can't get the permission necessary to start up a business. Unfortunately in Russia you actually need permission from officials to start a business. But they don't grant it. He doesn't have the money to pay a big bribe and anyway he doesn't want to hand money over to them. He hasn't been refused, but nothing is happening. They won't even accept his documents. Or explain what he has to do. At the moment he is living on occasional earnings, whereas he could well be providing a life for himself and his family - and giving others a chance to work. Kazan's pedestrian Baumann street is full of attractions. I've just re-read this letter and it does seem rather gloomy. You might get the impression that we're all just about to die out. Absolutely not, people carry on living. They do try and keep their distance from the authorities and the officials, which doesn't always work. But there are still beaches on the Volga, summer cottages and barbecues! We have our nearest and dearest, families and friends. You look at the enormous river, which just keeps on flowing without any hurry, you smell the freshness of the water and the pines and you calm down. The problems, the bureaucrats and the disorder of life all seem less important and you realise that eternity and the present are here and will be forever.